Let’s get one thing clear from the beginning; I’m no movie aficionado. Usually, my criteria for fun times at the movies are: 1) explosions, 2) people running from stuff, 3) an epic final showdown between the hero and the villain (often preceded by the hero fighting through a billion obstacles on his way to said final showdown). Given all this, I was actually looking forward to seeing Noah at the movies. I was interested because the film has, to put it mildly, attracted its share of controversy. Some critics like it, others hate it, and others are ho-hum. It’s also (surprise, surprise!) divided Christian opinion, with Pastors like Craig Gross leaping to its defence, and others like Matt Walsh tearing it down. Author and scientist Alister McGrath states in his biography of C.S. Lewis that analysing creative ‘art’ should include viewing the material produced through the lens of the writer. Only by understanding the author’s perspective, can you grasp what message is trying to be communicated. For example, if you want to know the real story the Narnia novels try to tell, view it through the lens of C.S. Lewis. If you want to know the real story behind Michael Lee’s poems, view it through the lens of Michael Lee. This film is no different. Regardless of the source material, Darren Aronofsky (the film’s director and hardly a religious guy) is now the ‘author’. This isn’t the Bible; this is Aronofsky telling his tale. And here’s where so many folk are (I reckon) running into trouble. Many people are viewing the film through the lens of the Bible. Now, this is understandable because, after all, Noah is a biblical man and the flood is a biblical narrative. The problem with this perspective is that at no point do we see the disclaimer in the film ‘based on a true story’. Or, if you’re an atheist/agnostic, we don’t even see ‘based on the biblical narrative’. In that sense, Aronofsky is free to amend the source material as much as Abraham Lincoln: Vampire Hunter altered Lincoln’s historical past. Yes, there’s a character whose name we recognise, but it’s hardly a biography of the man! This understandably upsets people because, to many people, the source material is sacred. For many, (me included) the story of Noah is a mini-narrative in the midst of a meta-narrative of God’s relationship with the world. The ‘Creator’ depicted in the movie is aloof, abstract and absolute (three A’s!). Noah is not so much a ‘righteous man’ as he is a fundamentalist environmental zealot. Noah’s family have little to no regard for the Creator; rather, they see Noah as their guide and are merely helpless pawns in the Creator’s game of chess. Anyone who knows anything about the Bible will immediately see some problems here. This is clearly a distorted representation of who God is, what He expects from humanity, what He sees as righteousness, and how He interacts with His creation. Furthermore, Noah has some SERIOUS (caps lock alert!) creative licences taken with his characterisation. 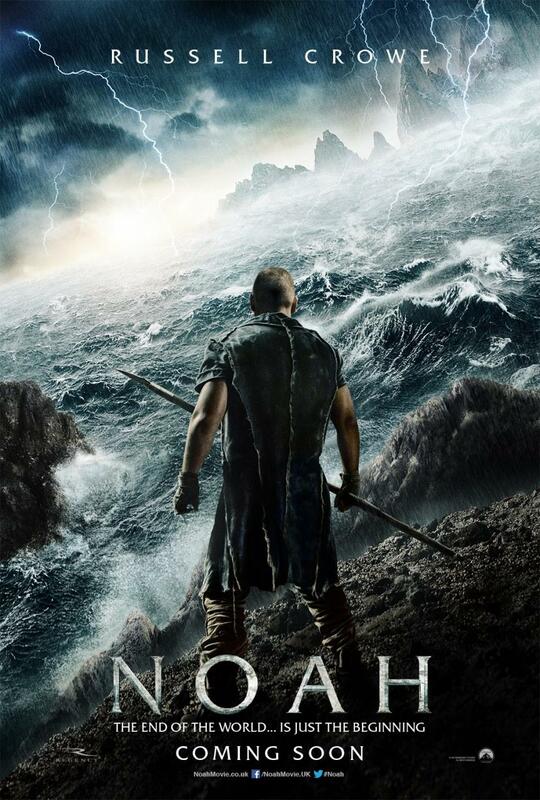 I won’t spoil bits of the film, but let’s just say that Noah is more hardline than Vladimir Putin and Benjamin Netanyahu put together – and that’s enough to make anyone shudder. That said, there’s enough stuff from the source material left over to still make you ponder some of the original issues the Bible wants us to think about (more on this later). But clearly, this is a ‘loose adaptation’ of a story, rather than one that makes an effort to stay true to the original piece. In other words, the film has its own story to tell. You hardly have to do much research to figure out the film’s primary message because it’s as subtle as a sledgehammer: humans have hurt the world and its animals, so now God is going to wipe them all out. It’s the most blatant politically-messaged film I’ve seen since Avatar. It’s environmentalism disguised as fiction. In fact, it’s so blatant in its messaging that the film borders on allegory. However, this is hardly unusual. For example, the Narnia novels are Christian apologetics/evangelism disguised as fiction. C.S. Lewis wanted a fresh way to share the Christian gospel with children and he determined the best way to do this was through stories. So, he did exactly that. Aronofsky is doing the same thing. The man is a hard-line environmentalist and wanted to get this message out. He reckons an effective way to do this would be through film, so he did exactly that. So, if you go to see Noah, you really should go in with a mindset of ‘what is the story-teller telling me’? “The movie centres on key biblical themes, while the portrayal of man's sinfulness is real and raw. We see humans as destructive, having ravaged the Earth's resources for their own gain and treated one another with absolute depravity. Issues that we are still contending with thousands of years later – slavery, human trafficking and environmental devastation – are also brought to light. Carey is spot on. Genesis 6:5 says: The Lord saw how great the wickedness of the human race had become on the earth, and that every inclination of the thoughts of the human heart was only evil all the time. This is fairly absolute and is essentially what the film seeks to communicate. The point of contention (I reckon) is the film’s definitions of good and evil. Aronofsky seeks to define humanity’s sin as the failure to properly care for creation. Now, you can’t argue with that. One of humanity’s primary tasks was to care for God’s creation! However, the extent of human wickedness is, perhaps, a little underdone. We see a bit of killing, pillaging etc, but the main message is clear: humanity’s primary sin is not caring for the environment and animals. Compare this with the Bible and, while yes, one of our prominent sins is a failure to properly care for the planet and its animals, our primary sin is being disobedient to God. The moral of the Bible isn’t to simply care for creation; it’s to love God and live in a proper relationship with Him (something that’s only possible through Jesus). "I think this is a good example of film doing what film does best - raising the big questions of life. What are we as human beings? Has there been a divine communication to us? Is God there or is he a figment of human imagination? And what about human nature; are we basically good, or is there something rotten and wicked in us? Is what's wrong with the world out there in other people – in serial killers, murderers and rapists – or is there something in us as well? The key, I reckon, is to view Noah as one person’s arguments for what truly matters, the nature of humanity and the possibility of a Creator. It’s impossible to walk out of Noah with your brain turned off. What about the actual film? I’m glad you asked! To be honest, I thought it was pretty lame. While some special effects were terrific (some of the time lapse stuff was outstanding), I reckon you simply can’t detach the visual spectacle of the film from the repeated head-battering you get from the extreme environmentalist messaging. So, if you’re into environmental causes and are getting a little sick of merely watching documentaries, then this could be a good film for you. Likewise, if you’re prepared to go in with an open mind and contemplate the big questions of existence, then this film will give you plenty of discussion material to do so. If though, you’re like me and all you want is some mindless entertainment (or even a pleasant film going experience) then give Noah a miss. Because while things blow up and people run from stuff, you can’t avoid feeling like you’ve just been subjected to a propaganda/horror double feature – and that’s not fun for anyone. Interesting article and thought provoking in itself. It is good to remind us that when viewing/reading/listening to different works of art, that we should always consider the 'lens of the author'.